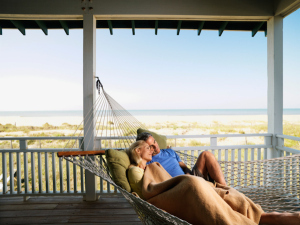 Whether you’re itching to escape the icy grip of winter or just want a place to take the family on the weekends, a vacation home can be a profitable investment—provided you know what to look for. Remember, you have the luxury of finding a home without plans to leave your old spot. Consider money spent on hotel rooms or at bed-and-breakfast inns as part of the investment—and take your time to find the right house. The median home price for vacation homes in 2013 was $168,700, according to the 2014 National Association of REALTORS® Investment and Vacation Home Buyers Survey. -Those items don’t even take the costs of into account of owning a vacation home rental, where you’d also need to pay a property manager, more maintenance costs and assorted other expenses. Sit down and make sure your budget allows for these extra costs. Then add in some extra money (at least a month or two) of living expenses to your emergency fund—which should already be about six months of living expenses, hopefully—to cover emergency costs specifically for the vacation home. A home in the hills miles away from town might sound attractive to you, but that doesn’t mean anyone else will want it. Always keep resale value and rental potential in the back of your mind when you’re looking for a vacation home. Current housing trends indicate homebuyers—particularly young professionals—are ditching the ‘burbs for city life. If this trend doesn’t reverse, it may mean houses far away from a major city will have a smaller pool of interested buyers. When shopping, view a potential vacation home as an investment property even if you have other plans for it. Check out important factors for home buyers including nearby schools, neighborhood safety and access to highways or public transit. You may never sell this home, but if you do have to sell at some point, you’ll ensure an smoother sale. Likewise, even if you don’t plan on renting your vacation home out, check out nearby rental prices. You don’t have to be a full-time landlord to make a little extra cash on the side: You’re allowed up to 14 days of renting your home, tax-free, each year. You may have to sacrifice some prime vacation time to maximize your rental return, but additional cash could help with something like needed repairs or updates. How far away is too far? According to the National Association of REALTORS®, 180 miles is the median driving distance for a vacation home. That’s about three hours of highway driving without traffic. The best vacation homes are easy to get to and have alternate routes to avoid gridlock. Whatever town or city you choose, spend more than just a few weekends there. You’ll want to be aware of any not-readily-apparent limitations, including any day-to-day hassles you might encounter. Talk to locals and spend time in different neighborhoods.